PT. Unilever Indonesia Tbk in Jakarta, Indonesia, won a Gold Stevie® Award for Corporate Social Responsibility Program of the Year (Asia, Australia & New Zealand) in the Company/Organization Awards categories of The 2013 International Business Awards. Entries to the 2014 International Business Awards, the world’s premier business awards program, are now being accepted. Get your entry kit here. We talked with Sinta Kaniawati, General Manager of the Unilever Indonesia Foundation, about its Stevie® Award-winning program. Waste pollution in tropical regions can result in malaria, typhoid, and dysentery. A lack of recycling programs has resulted in the burning of plastic waste, which has contributed to 5% of global greenhouse gas emissions, according to a World Bank Report in 2012. To tackle this problem, Unilever Foundation Indonesia developed its “Community Waste Bank Program” to empower communities to take action to reduce waste while receiving economic benefits. We asked Sinta what winning a Gold Stevie® Award for Corporate Social Responsibility Program of the Year had meant to the Foundation. The Unilever Indonesia Foundation launched the first Community Waste Bank program in 2004 with just 20 Community Waste Banks in Surabaya, Indonesia’s second-largest city with a population of over 3 million. By 2012, the program had grown to 499 banks, a 2000% increase in just 8 years. The program is now being carried out in the ten most populated cities in Indonesia, and reaches a combined population of more than 20 million people. The Unilever Indonesia Foundation program assists communities in developing a system where they can collect inorganic waste and sell it based on its value. The money is saved at the Waste Bank and can be cashed over time. The system works like a regular bank, except that individuals deposit waste instead of money. In 2012, 278 tons of waste was collected, generating 300 million Inodnesian Rupiah (approximately $26,000) of profits. This was shared by more than 28,000 waste bank customers and directly impacted 140,000 beneficiaries. The profits have enabled low-income families to buy 3 kg of rice per month. Areas with waste banks have reduced their waste by 80% and reported a considerable reduction in health problems. The waste bank program aims to realize the Unilever Sustainable Living Plan target of “Reducing Environmental Impact” with the target of halving Indonesia’s waste by 2020. In 2013, the Unilever Indonesia Foundation was on target to increase the number of waste banks to 700 while continuing to develop them into larger business units. The Foundation’s unique approach has put the community at the center, while engaging governments, NGO partners, media, and its own corporate functions to support the program. “Working with our NGO Partners, we trained the community to establish and manage the waste banks.” Sinta explained. “We support access to the market by establishing links with waste collectors as waste buyers. We also support the scaling-up of each waste bank to become larger business unit by approaching local banks to assist with soft loans for waste shredding machines.” Additionally, communities have been taught how to turn plastic waste into attractive recycled household items for sale; and organic waste is turned into compost. In 2009, the Foundation’s Community Waste Bank program won the Stevie® Award for Environmental Responsibility Program of the Year for adding value to plastic waste. The program has influenced the Government of Indonesia to include waste banks in Indonesia’s “Adipura” Cities Performance Awards; and it was adopted as a Best Practice CSR Program in Waste Reduction by Indonesia’s Ministry of Environment in 2013. We asked Sinta where the Unilever Indonesia Foundation would be focusing its attention in 2014. “Over the coming year, the three main sustainability programs we will focus on are health, wellbeing, and nutrition; reducing environmental impact; and enhancing livelihood—especially for Indonesian smallholder farmers,” Sinta told us. 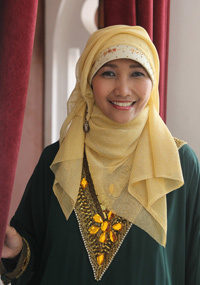 Sinta Kaniawati started her career in the corporate world in 1990 when she joined Unilever Indonesia as a management trainee. She built tremendous skills in market research, marketing for national and international brands, and customer development, and was assigned a senior position at Unilever Indonesia Foundation in 2007. PT. Unilever Indonesia Tbk is one of Indonesia’s leading Fast Moving Consumer Goods (FMCG) companies. Its portfolio of Home & Personal Care and Foods & Beverages products is distinguished by many of the world’s best known and most trusted brands, including Lifebuoy, Vaseline, Pepsodent, Lux, Pond’s, Sunlight, Rinso, Blue Band, Royco, Dove, Wall’s, Rexona, Clear, and others. Unilever Indonesia Foundation focuses on improving health, hygiene, and nutrition; reducing environmental impact; and improving livelihood through sustainable socio-economic programs with the community. The Foundation has been recognized nationally and internationally since 2007. In addition to The International Business Awards, it has received an Energy Globe Award; the Indonesian MDG Award for Environment, Improving Maternal Health, Reducing Child Mortality, and Combating HIV/AIDS & Other Diseases; and the Indonesian CSR Award and AFCSR Award.